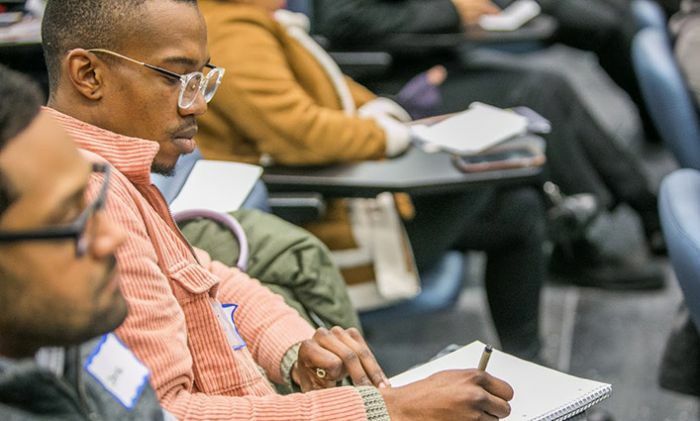 The John Jay Pre-Law Institute has long been preparing John Jay students from all fields of study for careers in law. At the institute’s annual “Law Day,” John Jay students and alumni have the unique opportunity to learn directly from law school admissions officers, current law students, and legal professionals about the study and practice of law. Each year, students look forward to attending the various events scheduled for “Law Day” and this year was no exception, drawing large crowds to its the morning and afternoon sessions. Through a variety of discussions and small workshops, students learned how to build a successful law school application; attended a mock law school class; listened to current law students talk about their transition to law school; and heard about the realities of a legal career from practicing attorneys. This year, the 13th Samuel and Anna Jacobs Lecture on The Law and the Legal Profession, a keynote speech from an accomplished and inspiring legal professional, was delivered by Shirlethia Franklin. Franklin is a Howard University School of Law graduate and has served as a judicial law clerk to the Honorable Alexander Williams, Jr., federal judge in the U.S. District Court for the District of Maryland. In 2013, under President Obama’s administration, she was appointed to the Class of White House Fellows, one of the most prestigious fellowships for leadership and public service. Katherynne Santos was one of the students who attended Law Day, where she had the opportunity to network with law school admissions officers and learn more about which schools she might want to apply to upon graduation. Santos, who has a two-year-old daughter, said that she initially came to John Jay thinking she would go into law enforcement, but she’s recently changed her mind. “It’s through law that I think I can have the biggest impact,” she said.